The back half of my mold is screwed up. I don't know if I worked too slow or didn't use enough water for the hydrocal, but the end result is that the back half is way to thin. Some of the registration keys are also pretty gnarly. 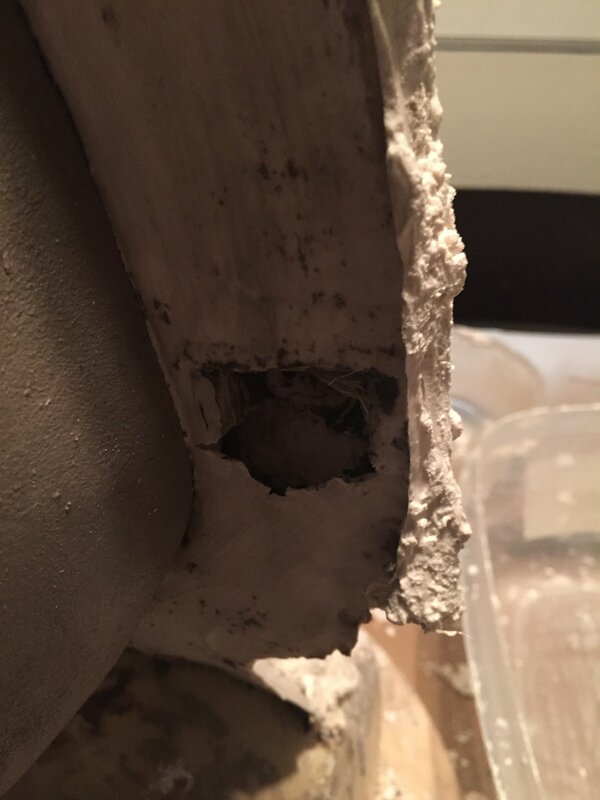 1) What can I do to thicken up/strengthen the back mold now that the hydrocal is set? 2) What can I do to fill in the gaps in the registration point negatives? Would an export putty or something similar work? Your idea of filling in some of the thin spots and voids with an epoxy putty should work, but might git a bit expensive based on how much you'll need. You can also clean up some of the edges with a sure form tool. Stone like hydrocal does not typically bond with stone that has already set unless there is a rough enough surface or things like exposed fibers for it to create a mechanical bond with. The back of your mold may be rough enough to allow for some bonding, but it's still a bit of a gamble. 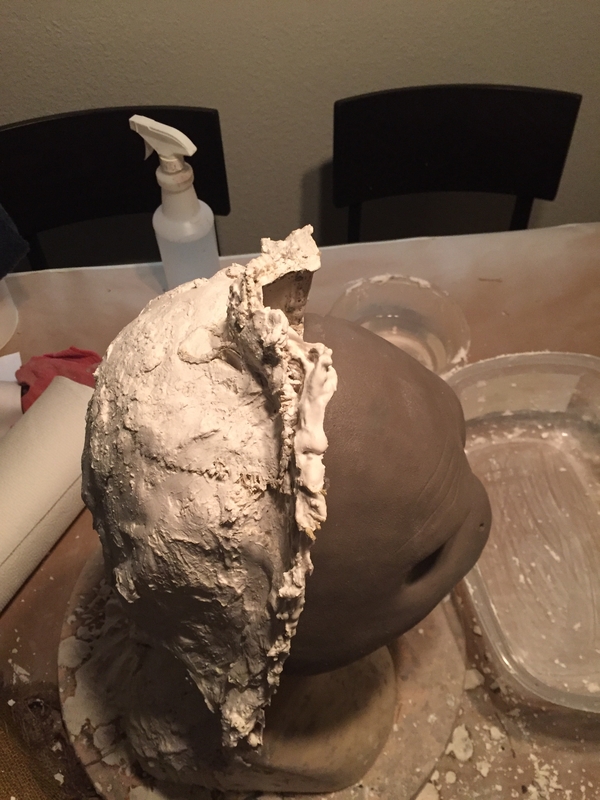 Since it's the back of your sculpt (which was a great place to start) you might be able to pop it off, touch up any surface damage on the sculpt, and start over. Here is a common method to mix up stone. Start with cool or room temperature clean water. Continue sifting in the powder until it breaches the surface of the water creating a small mound. Let the material absorb the water and continue sifting in more powder until the surface looks like a cracked dry lake bed. Up until this point you should only have been sifting in material, but never mixing. Now it's time to mix. You can use a drill attachment, stir stick, or my personal favorite a gloved hand. Make sure you break up any small chunks, scrape the bottom and edges of your container, and get a nice smooth consistency. That should give you a pretty well balanced mixture. You can add more or less powder to make it thicker or more runny as needed, but that's a good place to start. From there you can brush on a thin beauty coat (also called a print coat or detail coat) of stone onto your sculpt, and use an air compressor or blow through a straw on the surface of your sculpture to push the wet material into details and help pop any trapped air bubbles. You can then build up a bit of thickness behind the beauty coat before moving on to adding burlap/hemp/etc. You want to make sure you build up enough material before adding fillers or reinforcement so that anything you add does not sink down (or get pushed down) into the beauty coat or to the surface of your sculpt. Once the mold is dry, use a sure form tool to clean up any sharp edges and make the mold clean and easy to handle. Also, when making your mold keep in mind how you want it to be used. You can make the bottom of the mold a nice flat surface so it can stand upright on its own. 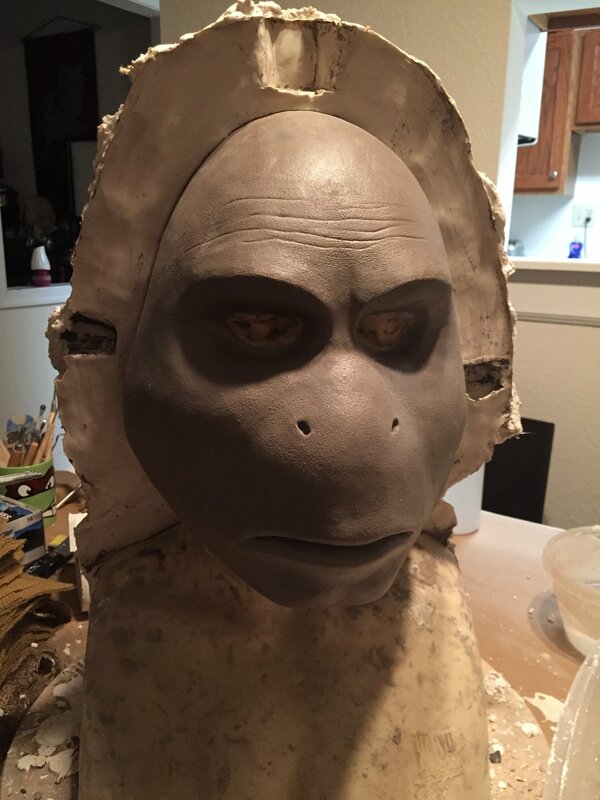 You also want to take into consideration where you are placing keys, and don't forget to add a few small pry points to help you remove the mold from the sculpt. Yeah, I had intended in making the mold much cleaner, but when I realized it was setting so fast I panicked and did as much covering as fast as I could. But the mess job should at least allow for some better mechanical adhesion. I'll try fixing this before redoing it. Actually, come to think of it, I've got a ton of bondo from my last project. i imagine that might be good for filling in the gaps and helping strengthen the mold?